Portrayed: In 1851 Shimazu Nariakira became daimyō of Satsuma. Nariakira and Minayoshi Hotoku - a physician - designed and built the Iroha-maru, one of the first Western-style ships built in Japan. Note: The real Nariakira probably didn't carry swords. Minayoshi sensei, You see these old ships of ours? It is time for a change in the way we do things. 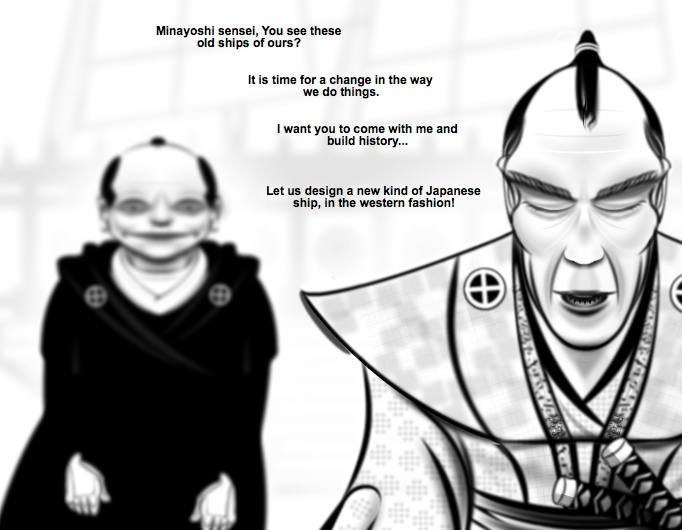 Let us design a new kind of Japanese ship, in the western fashion! Holy godamn! This is truly insane! Wonderful facial expressions with a lot of depth. I'm enjoying this series greatly. Awesome stuff dude, keep up the good work! @ambrosius Doing a whole series like that would be insane though. This is so cool. love your work.